Lake Jindabyne:- Has been great all over with plenty off fishing on both sides off the lake most fish are taking wet flies, Woolly buggers, fuzzys, Mrs Simpsons, Woolly worms are the stand out flies. In the afternoon a few people have been using red tags, klinkhammers, with good results. 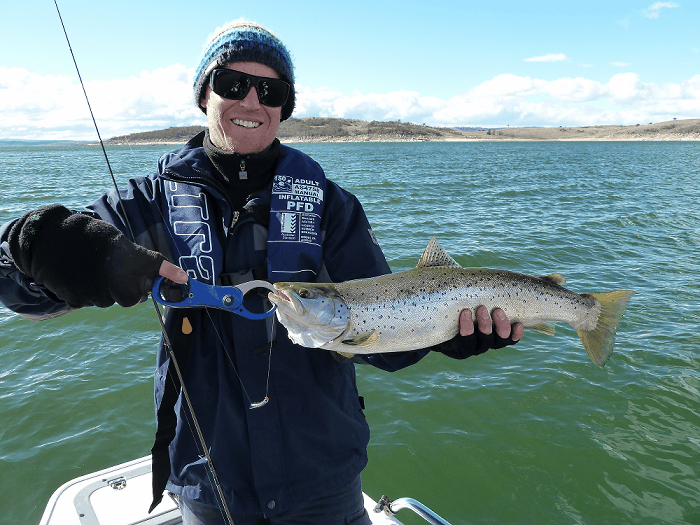 Overall Jindabyne has been the lake to fish the browns are in good nick with a few rainbows in between don’t worry the rainbows will be starting soon and what we have seen you will have a good time catching them. Remember when fishing the browns they are a lot slower than the rainbows so move your flies at a slower pace you will get better results. Most people have been asking me where are all the rainbows really I have no idea I do know there out there let’s just wait till November to see what happens. 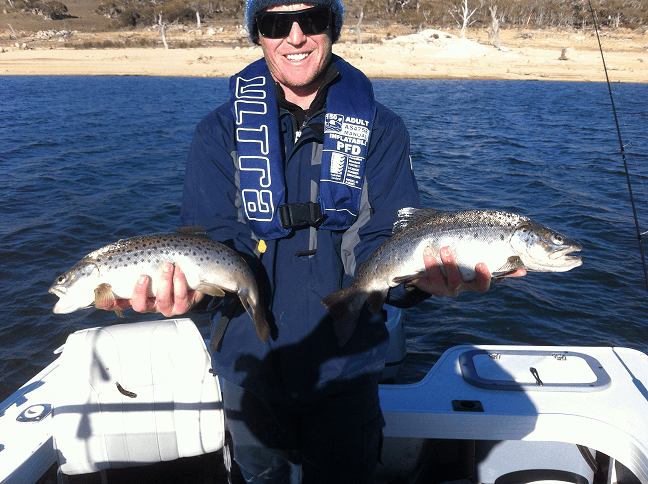 To me Jindabyne has been the best lake for fishing at the moment the brown have been in good condition and the rainbow have been well big when you get onto them. The Thredbo river is flowing well with some good rainbows moving up so things are looking good for the opening season remember that’s on the October long weekend. So things are looking good for the start off the season the lake in nice and high so let’s hope the money Makers don’t rip the guts out of it!!! As I said before well done to the people around Jindabyne the lake shore is looking great. Lake Eucumbene:-things are looking good around the lake and it’s moving up every day the fish are starting to get more and more active around the shore lines and the browns are moving in closer everyday with some good results coming in the browns are big and active and putting up a good fight so up your tippet. Not many reports are coming in but the locals are doing a good job. Best wet flies are woolly buggers, Mrs Simpsons, Fuzzys and bead head Nymphs. Again move them slow remember there not rainbows when using Nymphs you can use a quick jab with a paws this action works well on the rainbow. Don’t worry the lake is picking up every day and the fishing is Improving most reports are down the bottom end off the lake. The Eucumbene river is flowing well with some good rain in the past week and the rainbows are still there what I have seen there all in the deep runs remember when the season opens and your fishing the rivers get to the bottom that’s where the action is. Jindabyne is fish much like Eucumbene worms are the pick off the baits and the browns are big and fat the power bait is working well at jindy with more rainbows moving around. To me on the bait fishing both lakes are fishing well so you pick witch one to fish there both doing well good luck and tight lines. 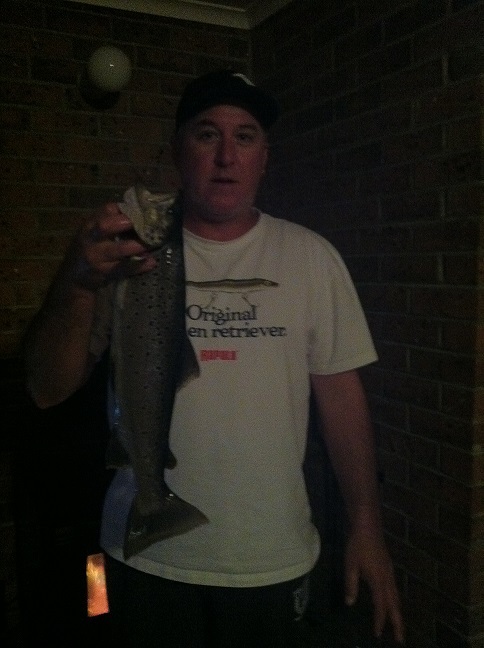 Well the spinning and trolling has been picking up and getting better and better with both lakes doing well. 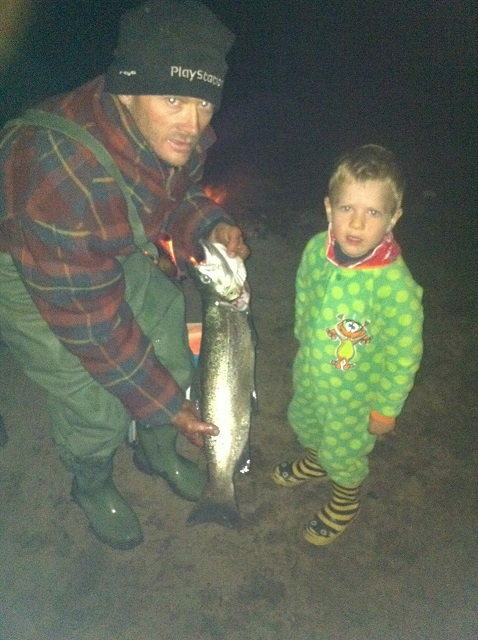 The trolling has been good with the rainbows and Salmon and browns on the move with many fish around the 8lb mark. 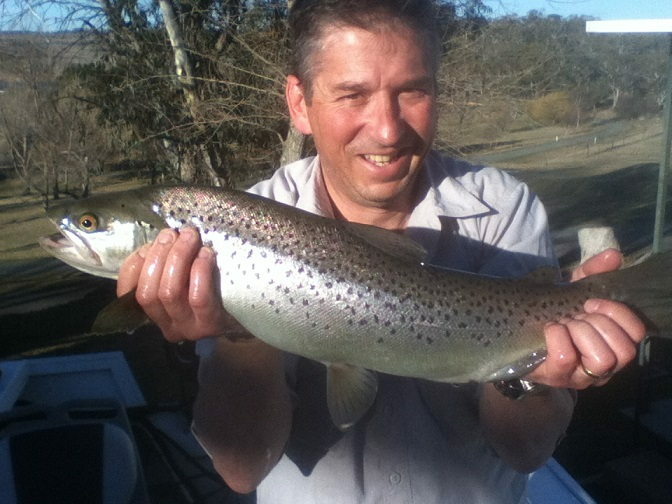 At Eucumbene again the fishing has been good down the bottom end off the lake with many good reports coming in. Spinning the banks with blades and Rapalas , Celtas are doing the best. Yes the fishing is picking up and it’s looking good for the start off the season with the browns looking more active this year. 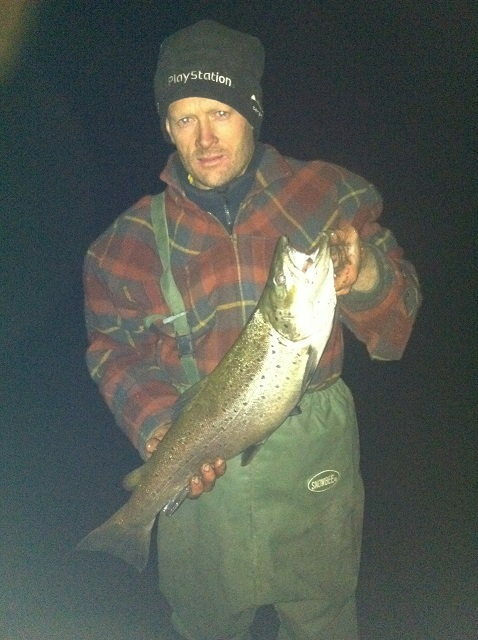 Most tassies are working well in all colours so load up your camera and get ready the fish are big and in good nick. So both lakes are fishing well so whatever lake you fish you should do well good luck. 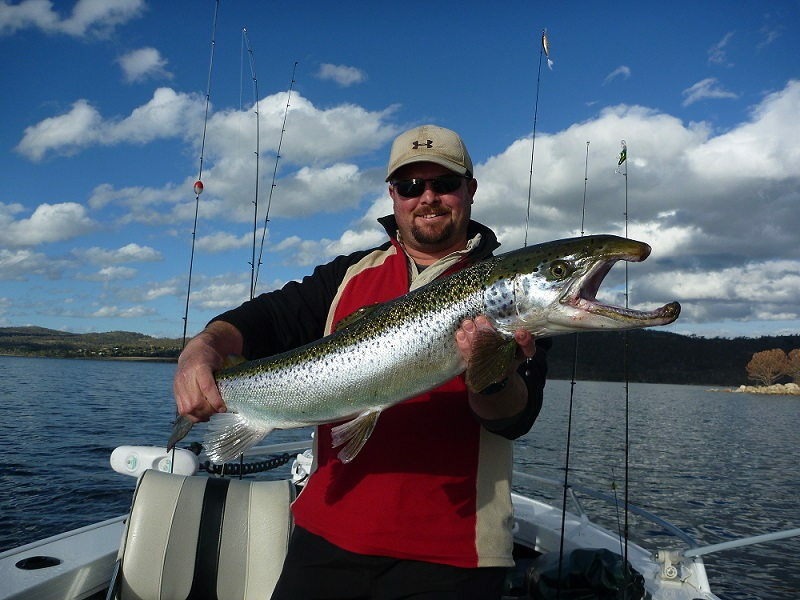 Thought I would send you this photo of a just over 11lb, 86cm salmon caught at Jindabyne on wed 18th of September. Picked him up between Cub island and town caravan park on a large Eucumbene bomber tassy devil. After a 20 minute battle got him close to the boat and had a hard time fitting him in the net but managed although a few nervous moments he was in the boat. Also a little bonus of a gold Dan McGrath lure in his mouth. Just a quick report on Lake Eucembene, we fished from the 9th-12th, Wind blew for the first three days, made it tough going, and on the final day it snowed! Once the weather cleared up the fishing was really good, mainly flat lining tassies, and also on the leadline, Most fish 2-4 pound, let quite a few go, the one's we did keep were full of yabbies. Fishing with worms was really quite, def take some yabbies next time around. Fished mainly around cobrabald bay, Did see the inspectors on the way out, which is good to see.